Today’s post is being donated to Food Bloggers Against Hunger. For all the recipes I share and meals I eat, there is never a moment that I take for granted the healthy food that is on my plate. A staggering 1 in 6 families deals with food insecurity in the United States, leaving many families to not be able to afford healthy, quality food. Our politics have put an emphasis on subsidizing processed foods, allowing their price to come down while fruits and vegetables continue to rise. The way we look at food in this country is skewed and it’s only getting worse. Today, as our government begins to take a look a harder look at spending, nutritional programs that help feed children who are at-risk for hunger could be cut. I’m asking you to take 2 minutes out of your day and tell congress to not cut these programs. Many times these programs are the only way children receive a substantial meal. Want more information? Be sure to watch A Place at the Table. I also highly recommend this Ted Talk and this book. The food system in the United States needs to change, in many ways. Every person that stands up and makes their voice heard is important. So, for today’s post, the goal was to create a healthy and simple meal. 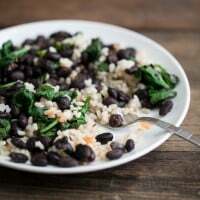 Black beans and rice is my go-to staple meal not only because it’s quick and easy, it’s fairly inexpensive. The base is simple with not too much work and the possibilities for toppings/add-ins are endless. Bring a pot of water to a boil. Add rice and continue to boil with no lid until cooked, 30-40 minutes. 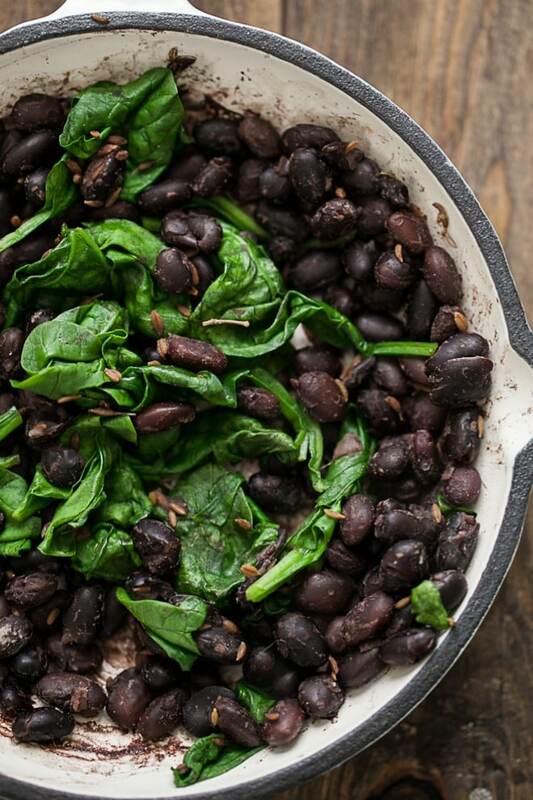 In a skillet, add black beans with liquid, cumin, salt, and lime juice. Bring to a boil, reduce to a simmer, and let cook until most of the liquid is absorbed. Once liquid is mostly gone, remove from heat and add spinach. Cover and let spinach wilt slightly. Mix in with black beans. 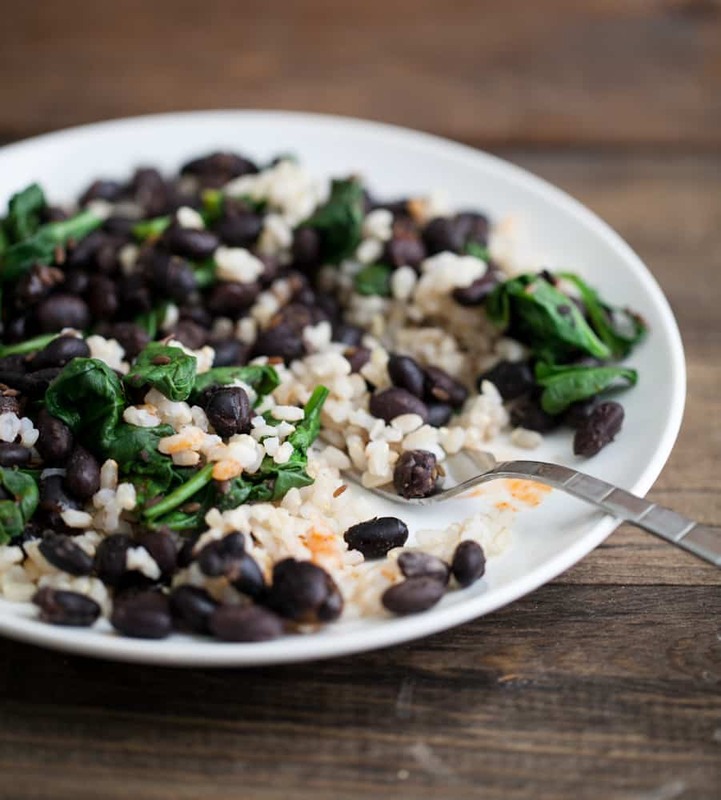 Serve black beans with rice. Add extras and toppings as desired. Don’t forget to write your politicians! I love this meal. So simple, so delicious! A weekly meal in my apartment! Love this idea. So simple, and lovely! I love this project! Wish I knew about it so I could be involved as well. 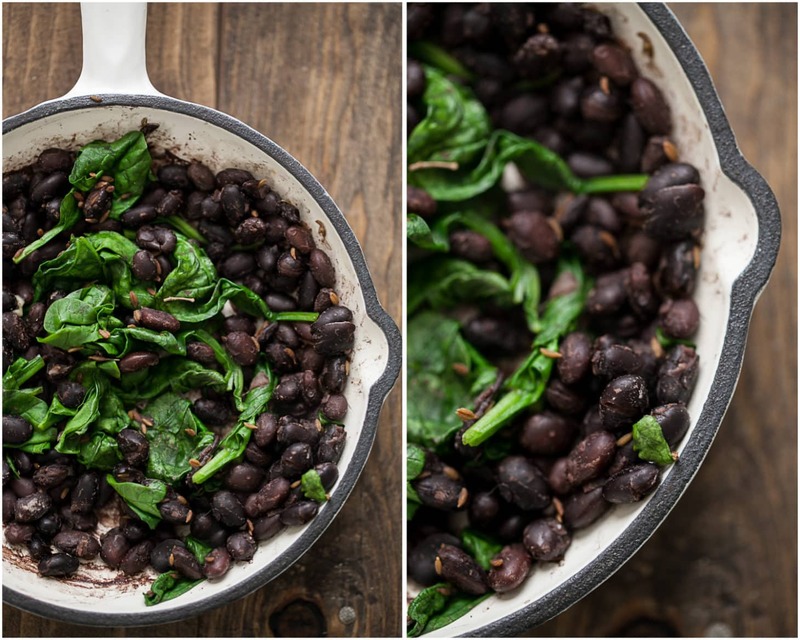 I love black beans and eat them often- this recipe is a good reminder that simple dishes are sometimes the best! 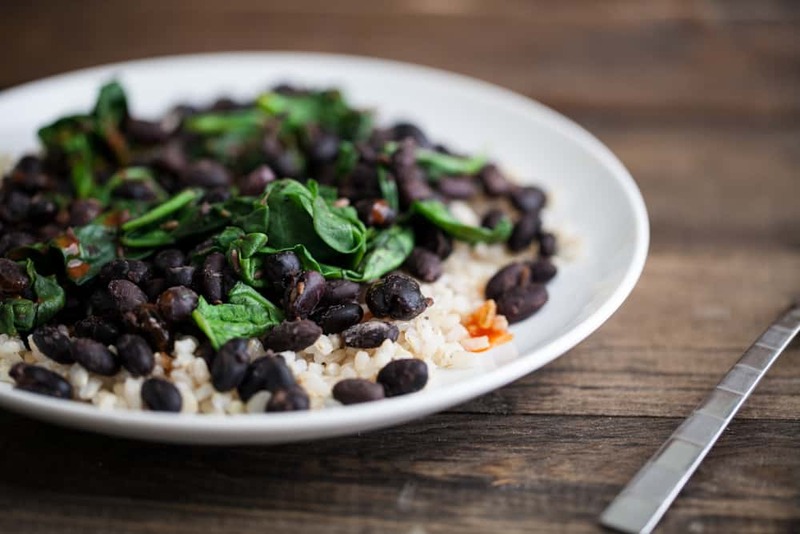 Black beans and rice are definitely one of the most affordable yet delicious and healthy meals out there. 🙂 I love the added greens! Facebook never shows your stuff in my feed anymore. I just went and fixed that and I am glad I did. I have always appreciated your AWARENESS of what we have access to that so many right here at home do not. This is a great dish and that is both delicious and nutritious. I am going to be adding my voice to those wishing to be heard. Thank you for bringing more light/awareness to this. I really want to read that book (after seeing that author on the movie). Lovely way (with suggested add-ons) to show that it really can be affordable and easy to eat healthfully. I totally agree. The outlook on food and healthy eating in this country definitely needs to change. Great post, simply beautiful dish. Beans and rice are such a staple in every country, the fun part is dressing them up. So glad to have been part of this movement too, you’re an inspiration sister. hi erin! this looks delicious. i bag and freeze my beans and don’t usually buy cans. would you have any advice for how i could substitute the liquid that would usually be in the can? could i use water? how much? thanks for the advice! Hi Crissy, I would recommend veggie broth but water would work well too. I’d start with a couple tablespoons and add as needed. Hope that helps! thanks! that does. i wouldn’t have thought of broth. thank you! Can kale be used instead of spinach?? Would it affect the taste of the dish?? This meal with be devoured this very evening… So simple, so perfect. So glad I was introduced to your site!!! This sounds so good. However, I will have to cook my own beans as I have not found low sodium or no salt beans here in Canada. Having salt sensitive slightly elevated blood pressure 420 mg of sodium in 1/2 cup of beans is way high for me if I don’t drain and rinse them. I am eating a bowl of this deliciousness right now. I cook mine in vegetable broth and a little bit of coconut oil/margarine blend. I add garlic, bell pepper, onions, and mushrooms…seasoned with black pepper and sea salt. Paired with a tomato sandwich on honey wheat is everything!